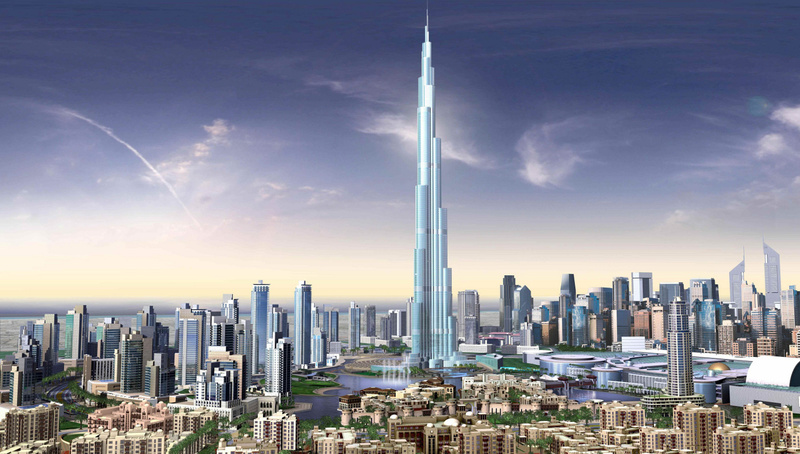 Today’s the day Emaar Properties unveils Burj Dubai, the world’s tallest building, a 818 m skyscraper in Dubai, United Arab Emirates. 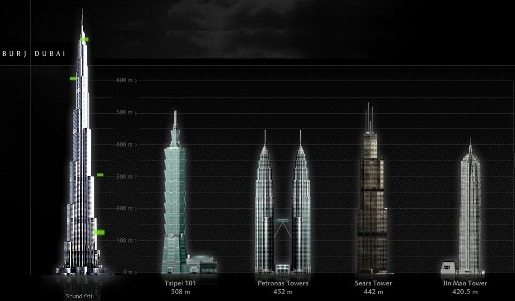 The world’s first “vertical city” is online at www.burjdubai.com, where visitors from around the world are provided with an in-depth introduction to every aspect of life, work and leisure inside the world’s first ‘Vertical City’. The Burj Dubai has been renamed the “Burj Khalifa” after the ruler of Abu Dhabi, who has been pumping money into Dubai to help pay its debts. 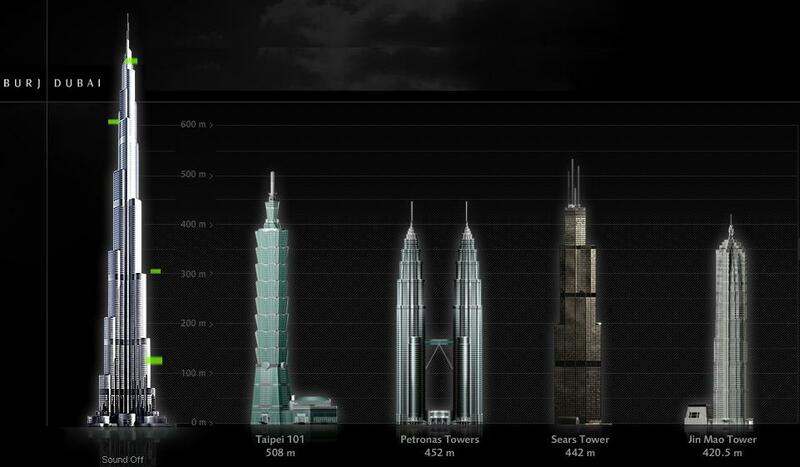 The new building breaks several international records, including tallest structure to top of spire (previously Taipei 101), top of roof (previously Taipei 101), top of antenna (previously the Willis Tower), tallest structure ever built (previously Warsaw radio mast), tallest freestanding structure (previously CN Tower), building with most floors 160 (previously World Trade Center 1 & 2 had 110), world’s highest elevator and world’s fastest elevators, highest vertical concrete pumping for any construction, tallest structure in history to include residential space, highest outdoor observation deck in the world, and highest installation of an aluminium and glass facade (512 metres). 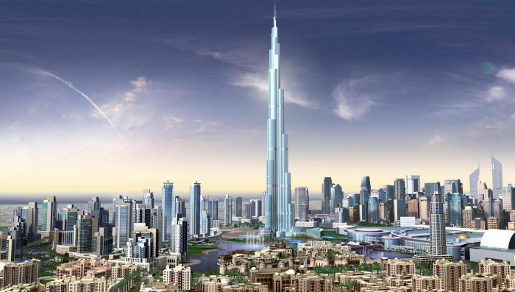 The unique design of Burj Dubai was established in the context of a design competition won by Skidmore, Owings & Merrill LLP (SOM), Chicago, with Adrian Smith, consulting design partner. 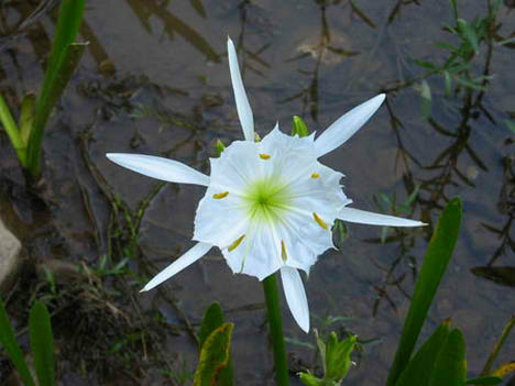 The architecture features a triple-lobed footprint, an abstraction of the Hymenocallis flower. The tower is composed of three elements arranged around a central core. The modular, Y-shaped structure, with setbacks along each of its three wings provides an inherently stable configuration for the structure and provides good floor plates for residential. Twenty-six helical levels decrease the cross section of the tower incrementally as it spirals skyward. The central core emerges at the top and culminates in a sculpted spire. A Y-shaped floor plan maximizes views of the Arabian Gulf. Viewed from the base or the air, Burj Dubai is evocative of the onion domes prevalent in Islamic architecture.